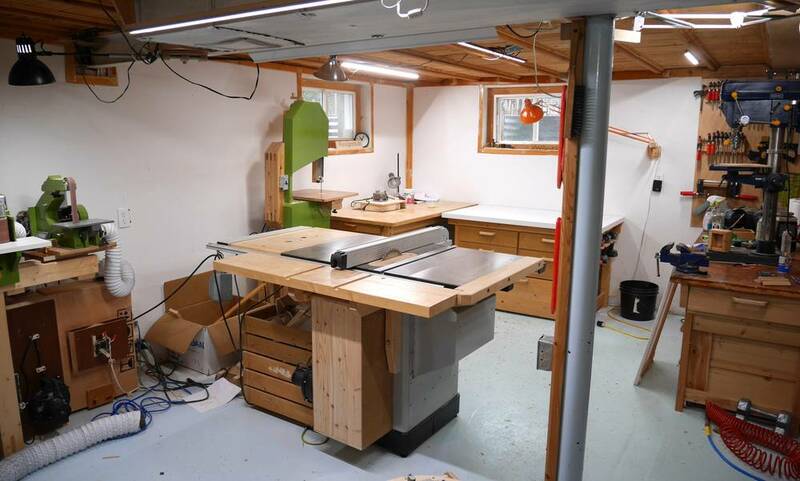 A solidly built basement sounds like a perfect choice for a DIY enthusiast’s workshop. The space is already there, the temperature is usually mild, just a few degrees lower than in the rooms above, utilities’ junctions and outlets are readily available, and the whole area is probably accessible from both indoors and outdoors. Still, in order to start moving your tools and machines down, there are several considerations to take into account. Once you clear out these, your basement can become an enjoyable space for your projects. Before your workshop can take its shape, it’s essential that the whole area is dry, accessible and that it meets local building codes. When it comes to basements, waterproofing can be a challenging project, especially if you live in an area with a high water table or a region prone to flooding. Even if neither is the case, basement air is often moist from the surrounding earth and lower temperature. Further on, some building codes also require a fire egress or emergency exit if a basement is to be used as a workshop. It might be a large accessible window or a door with an accessible hallway and stairs. Not many basements are projected as spaces with plenty of light and sufficient outlets, which is something to be considered. All the electrical outlets that your electrician installs need to be grounded and wired on 20-amp circuits, with some building codes requiring Ground Fault Circuit Interrupters (GFCIs) for every outlet installed in a basement. Not to mention that large, power-hungry machine tools such as table saws and lathes need their own separate circuits. While overhead fluorescent or LED lights provide general lighting, consider additional clip-on work lamps for task lighting. Although hardware stores and home centres sell a range of workbenches, you can probably build one of your own, of equal or even better quality, and for less than what you’d pay for a ready-made one. There are roughly three types of workbenches: the traditional cabinetmaker’s bench, the utility workbench and the metalworking bench. Traditional benches have thick hardwood tops and sturdy wooden legs. They have a freestanding configuration, so you can place them wherever it suits you, and work around all four sides. The extra thick worktop made of hard maple or beech laminated blank absorbs the vibrations, while the added weight keeps the bench more stable. Although your workshop will constantly grow as your skills as an amateur handyman develop, there are some essentials that no workroom can go without. As a great complement to an ordinary circular saw, a cordless variation is handier and easier to use in tight spaces or awkward situations, just like a cordless drill. However, a drill press is indispensable for its precise and even action. Fitted with a reliable measuring stop, your circular table saw can turn into a high-productivity workstation ideal for extensive house projects which require a large number of identical or precisely cut pieces. Sawdust and fumes from paints, stains and varnishes can deteriorate the air quality in your basement workshop. Not only is contaminated air unpleasant to breathe but also highly fatiguing and unhealthy. Portable fans are a great solution for moving the air towards the door and windows while you’re sanding, sawing or applying a coat of varnish. By placing a fan in a window or doorway opposite another open window, you will create a cross breeze that removes the dust and fumes. It’s not a rare case that a home’s basement serves as a makeshift storage of items that are better given away or stored properly elsewhere. In a few essential steps, your basement can take a turn toward becoming an ultimate DIY workshop and a breeding ground for your future projects.